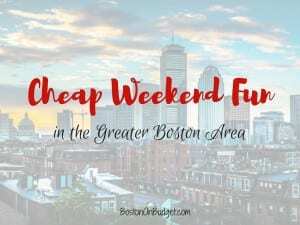 Cheap Weekend Fun in Boston for September 1-3, 2018! Happy Labor Day Weekend! Here’s a few things to do this weekend in Boston if you are looking for something to do! Free Admission to the ICA: Monday, September 3, 2018. Free admission to the ICA from 10-5pm on Labor Day! Bank of America’s Museum on Us: Saturday and Sunday, September 1-2, 2018. Bank of America & Merrill Lynch cardholders can get into select museums the first weekend of every month for free by showing their bank card (per cardholder, not family). Museum of Fine Arts, MIT Museum and other museums across the state participate. SoWa Open Market: Every Sunday May to October from 10-4pm. Enjoy this award-winning open market with local artisans, farmers, musicians, food trucks, and more! Greenway Open Market: Every Saturday (and 1st and 3rd Sunday of each month) from 11-6pm until October. Enjoy handmade local arts and crafts, food trucks, and more!